Correlation refers to the idea that two variables (x and y) impact each other. For instance, the grades in a statistics class may be related to, or correlated with the amount of time those students study. As study time goes up, grades go up. This would be a positive correlation. On the other hand, as time spent partying, grades go down. This is called a negative correlation. A positive correlation doesn’t strictly refer to good things, though. As the percent of poverty in a community goes up, the amount of crime may also go up. This is a positive correlation, but certainly not a good thing! Correlations are expressed from -1 (which is perfectly negative) and +1 (which is perfectly positive.) The number shows the strength, and the sign (positive or negative) shows the direction. Therefore, -0.75 is a stronger correlation (or connection) than 0.25. One common expression is “Correlation is not causation”; this refers to the idea that items can be correlated without really being related to each other. For instance, there is a close connection between the rates of ice-cream consumption in the winter and the drowning rate, even though one really doesn’t affect the other. This formula may look complicated, but let’s step through it step by step. The sum of the values of X subtracted from the mean of X multipled by the values of Y subtracted from the mean of Y divided by the square root of X subtracted from the mean of X-squared multiplied by Y subtracted from the mean of Y-squared. 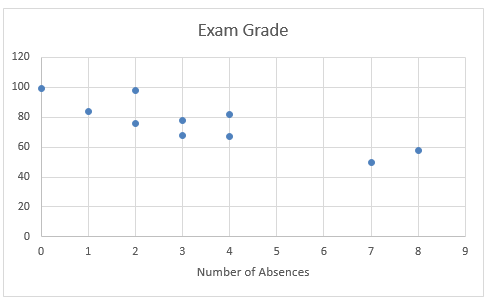 This shows a moderately negative correlation, as absences go up, grades go down. 82 + 98 + 76 + 68 + 84 + 99 + 67 + 58 + 50 + 78 = 760 / 10 = Mean of Y of 76. Next, we calculate X-Mx and Y-My, and sum them up. We take the square of each of the X values and sum them up. We do the same for the Y values. Next, we multiply the two bottoms together. 56.4 x 2262 = 127,576.8. Taking the square root yields 357.179. Our final calculation is -304 / 357.179 which equals -0.85. -0.85 is our final correlation, which we can confirm using Excel’s CORREL function. Cite this article as: MacDonald, D.K., (2015), "Correlation (Calculating Pearson’s r)," retrieved on April 20, 2019 from http://dustinkmacdonald.com/correlation-calculating-pearsons-r/. This entry was posted in Math and Statistics and tagged correlation, statistics. Bookmark the permalink.